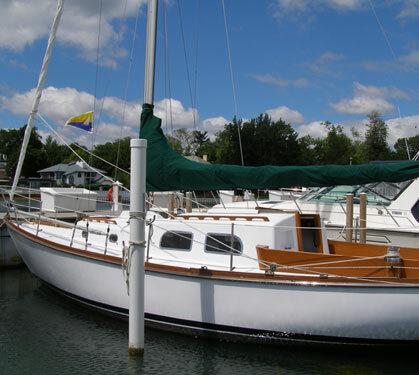 This is my personal boat a 1979 Fortier 26 that we just restored. We used your product for the foredeck and gunnels and it is holding up very well despite heavy use (lots of bass fishing). The non skid does not hold dirt or blood and is easy on the feet for those of us who fish barefoot. We have a testimonial for you with regard to the use of Coarse Grade Soft Sand rubber particles used to make a non-slip surface for dog agility equipment. I’ve enclosed several snapshots of our dog — Freckles — using our just finished Teeter-Totter (or See-Saw) obstacle coated with Coarse Grade particles and painted with Behr Outdoor Paint. The particles were broadcast on wet paint. The board is a construction grade 2″ x 2″ x 12′ that has two cleats holding it to the 1 ½” schedule 40 PVC pipe frame. The use rate was 1 pt. coarse grade particles for 12 square feet of Teeter-Totter board. The particles were top-coated once. All paint was applied by brush. 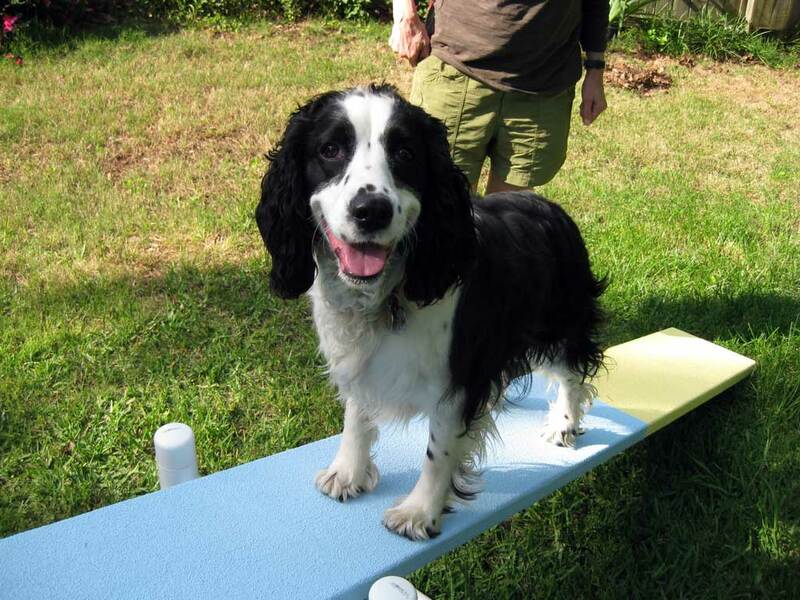 We’ve constructed several dog agility obstacles for use in training our 2 ½ year old English Springer Spaniel – Freckles. She has competed here in Arkansas as well as in Mississippi and Florida and has been successful in winning ribbons and awards. Daily training is important and so our backyard agility course allows for practice in between her weekly training classes. We spent a great deal of time trying to find a product that would provide a non-slip surface for our dog on the Teeter-Totter. Your SoftSand Rubber particles made the top of the Teeter-Totter into a wonderful non-slip surface. Freckles moves up and down the board with ease and is sure-footed. SoftSand Rubber worked extremely well. A newly renovated non-skid deck is one job that, for a moderate bit of effort, the results are big! 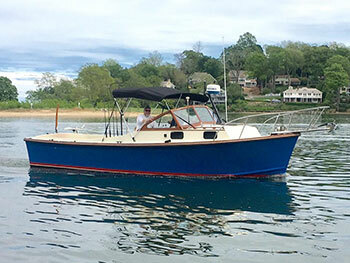 My boat, a 1981 CD30 had a deck with some gel coat crazing (surface hairline cracks), stains, and most important of all was lacking in non-skid in critical areas. The cockpit sole and the boarding gate area surfaces were quite smooth, due to years of use. This was on my list of renovation projects for quite a few years, and this summer I finally scheduled this project, and I’m happy to report on the results. First, I wanted to find a product that I like for the non skid properties. The past couple of years I visited boat show booths, and researched on the internet to find my choice. Some manufacturers have non-skid particles premixed in their paint, but personally, I did not like the size of the particles or the type of particle in use for the samples I examined. I realized that for this custom job, I will need to decide on my deck paint and then add the non-skid particles that I like to the freshly painted surface. I this way, I could control the type and the amount of non-skid, and still get the paint that I wanted. Also was the issue of color. I wanted to keep my new deck color close as possible to the existing one because I liked how it looked. I decided on using Interlux Bright Side, a one part polyurethane paint. I have used both the one part and two part paints, and decided that for this job which will be completed in the summer sun at portions of time, with the interest of ease of use, that the one part polyurethane to be the paint of choice for this project. However, I could not find a color to match the existing boat deck, so I experimented by buying a couple of quarts of beige and decided to mix them. I got lucky and found that a 50/50 mix of Interlux Grand Banks Beige and Bristol Beige is an almost exact match to the original paint on my Dory! In regard to the non-skid particles, I wanted to try a softer rubber particle that would give me a superb non skid. I also want to be able to kneel on my boat deck to varnish the teak with a measure of comfort so that I’m not getting skin abrasion therapy. I found some particles (used for truck bed liners) to be over-sized and downright obnoxious for our beautiful pleasure craft, and some to be the opposite; too small for a good grip when you really need it in a seaway. After examining the samples I got form the internet stores, I chose a product called SoftSand Rubber. The company, SoftPoint Industries, is based in Copley, Ohio, and specializes in manufacturing rubberized particles just for non-skid use. Their particles have color pigment throughout and are not made like other manufacturers from recycled car tires. I chose the beige particle in a medium grade for size. At home, to be sure of the final result, I experimented on a scrap piece of hardboard, with the paint and particles, and I was quite satisfied with the sample. The weather forecast looked good for the next couple of days, so on with the job! To prepare the decks for epoxy filler and new paint, I thoroughly cleaned the deck with Simple Green, a de-greaser. I then wiped the deck surface with a rag soaked in Interlux Fiberglass Solvent Wash 202. Any similar de-greaser or solvent cleaner would do, and be sure to wear protective gloves for your skin. To fill in any hairline cracks and imperfections in the surface I used the West Epoxy system, simply wiping it in with a latex gloved finger. Since the cracks were so small, no filler additives were needed in the epoxy. The next day, after the epoxy cured, I then power sanded the deck surface with a coarse 80 grit, and blew off the dust with my yard blower. After another wipe with solvent cleaner I then taped off the non- skid area, using the 1’ wide and 2’ wide (for corners) blue painters tape. This is the most time consuming of all of the steps, especially cutting the rounded corners. I used a circle template to help outline the 2” wide tape before cutting the corners. After the masking tape was down, the easy part remained of placing the finish on. I painted in sections of approximately 3 linear feet, because the paint was setting up quickly in the heat, and I wanted the non-skid particles to sit in the paint. For the non-skid placement I decided on the “Broadcast” method instead of mixing the particles in the paint. The broadcast method requires you to shake the particles on the painted surface, out of a container that is similar to a salt dispenser. In this way I could obtain a heavy coat of non-skid particles that I desired. 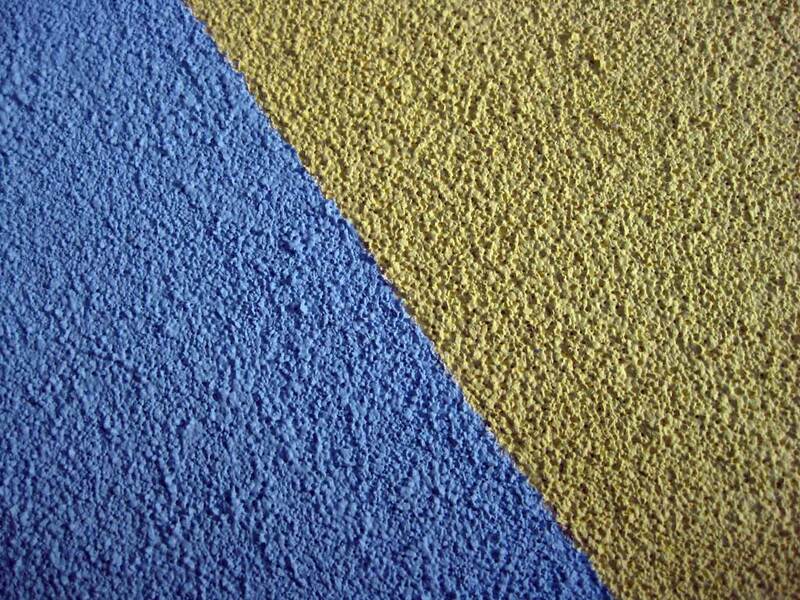 Mixing the particles in the paint is fine also, but will result in a less dense non-skid. Remember the heavier the coat of non-skid the more dirt you will tend to gather on deck, but in the interest of a safety I applied the particles liberally and always make sure to board my boat with clean shoes. After broadcasting the particles in the previously painted section, I continued to brush on more polyurethane, and then spread the particles. Depending on the weather, you would have to monitor the set up time of the paint, but if it is cool enough, you could do a whole non skid section at a time. The next day, I vacuumed the remaining non skid particles not adhered to the paint with a shop vac, and placed the second coat of paint on. This coat of paint brushed on slowly over the heavy base coat of non- skid particles. The next day, I removed the tape and what I saw brought such a smile to my face. The deck looked as if it just came out of the factory! 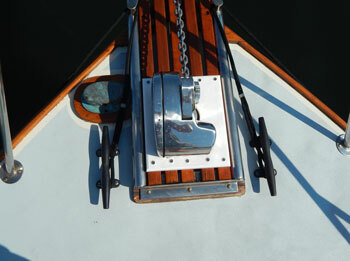 I completed sections of my deck in consecutive days, so that I could step on other parts of the boat. The entire project was in the works for about a week. After 4 months of use, I must say that I am very satisfied with the products that I used and the appearance of my decks. Only time will tell how the new non-skid will hold up, but I kept some spare paint and Soft Sand particles in my workshop for any touch-up’s if needed. I have sent in some photos of the project although the print quality probably will not justify the beauty of the new deck surfaces, which has to be seen in person and felt with bare feet! The 2004 hurricane season took a hard toll on the Bellair Condominium in Daytona Beach, Florida. Damage to the roof, skin, and walkways of the building left the building susceptable to water intrusion. 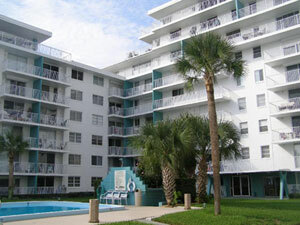 R&J Coatings and Waterproofing of Daytona Beach was selected for the restoration project. 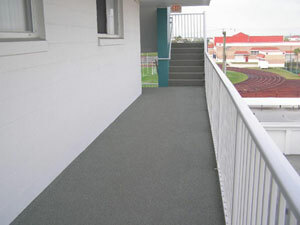 SoftSand rubber particles were utilized to restore the decking of all the walkways and balconies. The unique rubber decking which should provide years of maintenance free waterproofing, as well as an attractive finish. 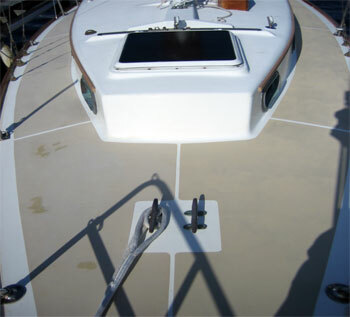 I promised to send photos of the finished sailboat deck where I used SoftSand Rubber product. After the deck was taped off, we rolled on about 4-5 sq. 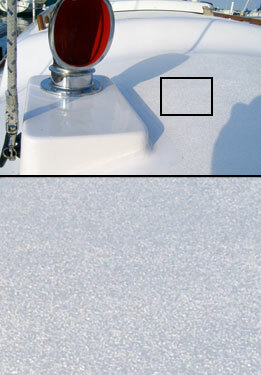 ft of Awlgrip marine paint and sprinkled the SoftSand particles using a shaker. The shaker had holes that were about 1/16″ diameter (larger than a salt shaker). After the SoftSand was applied and the Awlgrip dried, a second layer of Awlgrip was rolled on. The surface is quite aggressive but this is how I like it on the deck!